Oh, did I mention the extruder firmware problem is fixed? :) It was actually a wiring problem in my electronics, but I have discovered several other issues that I have fixed and committed. I have also committed to CVS some more work on the java drivers for the extruder. 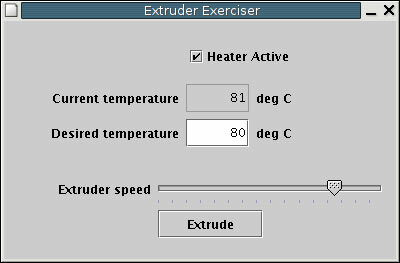 There is also a test application for extruders that you can access from the Tools menu of the RepRap application. It lets you specify a temperature and the extruder will automatically maintain that temperature. You can also drive the extruder motor. The PIC firmware supports both "chop-chop" and dynamic heating. Chop-chop heating results in a temperature that wobbles around the target temperature while dynamic heating gives much more precise and stable heating. Currently the Java code only supports the chop-chop heating because it's a bit simpler. You need a little bit of a thermal model to make the dynamic heating work properly, so we can get to that later. The chop-chop heating doesn't seem too terrible anyway judging from my experiments with it today.